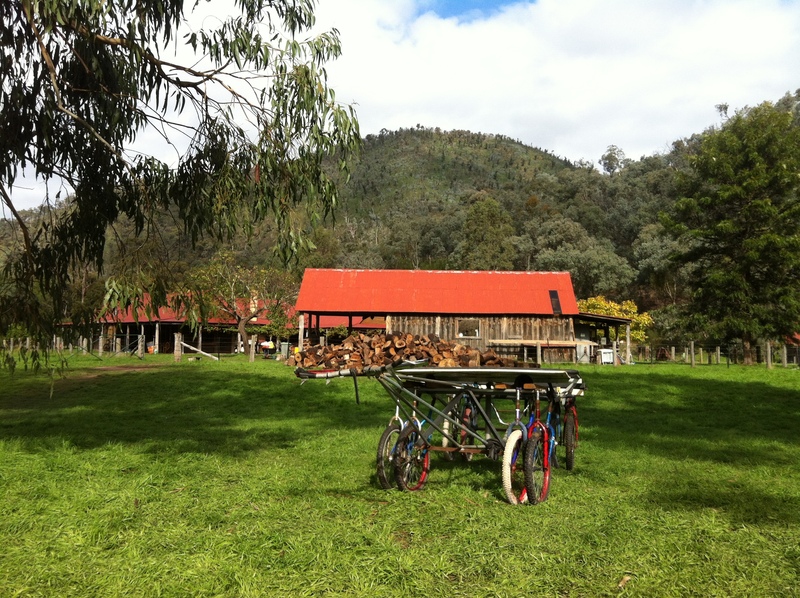 Last weekend I joined a working weekend at the not-for-profit Wollangarra Outdoor Education Centre in Gippsland. I learned of its existence after seeing a Team Leader vacancy advertised – one that appealed, and which I seriously considered applying for, although it was effectively a volunteer position with only a small monthly stipend paid over and above board and lodging for the live-in role. Wollangarra is situated in a remote valley on the edge of the alpine area around 70kms NNE of Traralgon. It has no mains electricity or water, no mobile phone signal, no internet. The only way to access the site is by flying fox across the wide Macalister River. It is the antithesis of everything that most of us have come to take for granted in the 21st century. And I loved the idea of escaping to that for a year. When I learned that one of their regular volunteer working parties was coming up, I didn’t hesitate to get in touch and commit to joining in. I thought it would be a great opportunity to check out the place and see whether it could be the right move for me. The drive to the site was arresting, especially once I’d got past the nearest town Heywood, and turned off at Lake Glenmaggie. Poor Sweetie had a bit of a hard time of it! Up, down, round the bend, up again, then down again – beautiful countryside with stunning views at every turn and some dramatic drops off the side of the road to add to the excitement. After parking alongside a dozen other cars at the gate, turning off my mobile phone, and walking for 20minutes with my pack to find the flying fox launch point, I waited for what seemed an eternity for someone to answer my repeated cooee’s for the help I needed to cross the river. All the while, I began to doubt: what on earth was a doing? Was this really a good idea? What if it’s some bizarre cult thing I’m getting myself into? Should I just turn around and trudge back to Sweetie and go seek some other adventure for the rest of the weekend? Before I had time to act, a person appeared across the river and the flying fox was sent across. I was relieved to see that I didn’t need to hang on with my rucksack on my back, as I had pictured in my mind. Instead it was a solid carriage that could carry four people sitting, complete with re-purposed car seat-belts and comprehensive instructions to maintain safety for the 50m journey to solid ground on the other side. A good thing – at the highest point, it must have been a drop of 10 metres to the rocky river bed below, which was covered by only shallow water. Disembarking on the other side, I met a near-neighbour (from Ballarat) who spent a year working at Wollangarra in the late 90’s and returns regularly for working weekends. As it happened I’d arrived just in time for a cuppa and home made cake. Not a bad start. 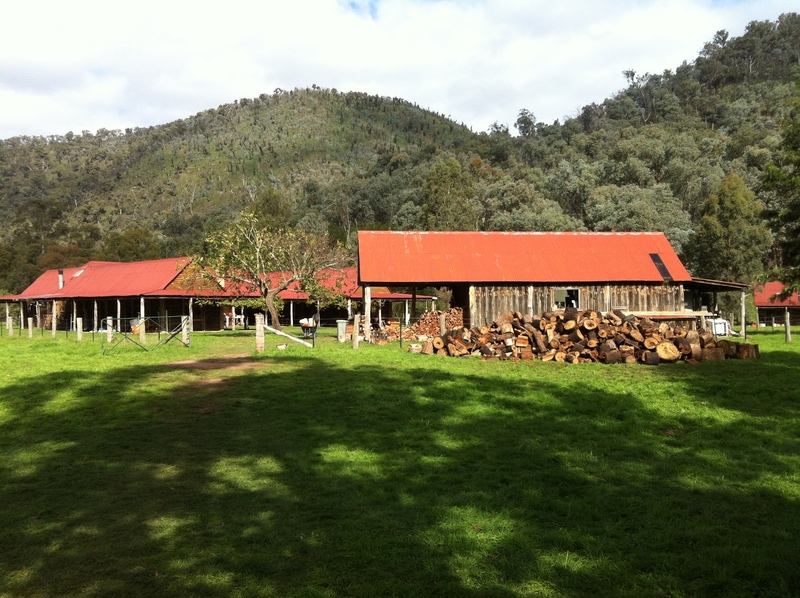 I was treated to the grand guided tour of the site – the surprisingly warm and comfy homestead building, the various outbuildings including the ablutions block and outdoor kitchen, which was the major construction project for the weekend with an extension in the making, plus the garden, chook run, kit store, salvage yard, and dug out (fire refuge). Despite all I’d read about Wollangarra before arriving, nothing really prepared me for two things about the place: one, how rustic and basic it is; and two, how beautiful. The centre sits in one of the most picturesque, fertile, intimate valleys I think I’ve ever experienced. The group cooees that punctuate the day to announce meal and break times echo magnificently off the surrounding hills. That echo seems to both highlight the remoteness of the location, and reassure you of the friendly community at its heart. It should have dawned on me sooner, but it was only when I saw the toilets and showers that I realised the logistics of a venue with no water on tap. Composting toilets of course – not too much of a problem, I guess I could get used to that. But the shower “complex” – although stunning with its open windows offering serene views across the site – gave me the shivers! Nice in summer I’m sure. But the thought of only having one hot shower a week (as I learned was usual for staff), in an open draughty building that required at least an hour’s forward planning to light and heat up the massive wood burning heater unit, was a bit hard to reconcile. I like to think I’m a bit considerate when it comes treading lightly on the earth. I’m usually quite careful with electricity, walk or cycle or take public transport in preference to my car where practical, consider food miles when I shop, and try to minimise waste. However, a hot shower has long been my downfall. I somehow lose track of time under one. I know it’s the last bastion I need to conquer. I just don’t think now is the time – not when I’m already struggling with life in a much colder climate than I was born and raised in. That might just be too much of a shock to the system. So, already doubting my ability to live this lifestyle long term, and after also hearing that my guide was the oldest staff member ever at Wollongara when he started at the tender age of 35, I really did have serious doubts this was the job for me. I was given a choice to dive in with helping at any of the many tasks I’d seen taking place during the grand tour. I chose the garden. On my way in, I considered asking for some gloves to protect my precious hands – I rarely garden without them at home. But then I thought “what the hell” and got stuck in. I was invited to join in weeding a couple of raised garden beds riddled with oxalis. I’d vaguely heard of the weed before, but had no idea how insidious a weed it is. A frail looking leafy plant on top, it spreads bulbs an astonishing depth into any garden bed it takes hold of – and unless you get as many of these bulbs out as possible, it will just come back time and time again. So there we were – pulling off the top layer of green stuff, then digging and sifting through a foot of earth or more to seek out the bulbs. Depending on the stage of the plant’s life-cycle, these range in size from 1mm to 1cm, sometimes orange sometimes white, sometimes with astonishing translucent growths developing bizarre shapes. And we had a good old chat at the same time, with both of my fellow weeders offering compelling insights into life at the centre. Once I got my eye in, I was astonished at how many oxalis bulbs I found – amongst the earthworms, skinks and spiders. And I watched with a strange kind of wonder and glee as my fingers became darker, and my nail beds full of the richest darkest soil I’ve seen in a long time. Before I knew it, the collective cooee went up for lunch. After a hearty warm soup and bread, and a bit more of a chat with lots of new faces as we did the dishes afterwards, it was back to work. Alone this time I returned to the weeding, the others having found something more challenging to take on. 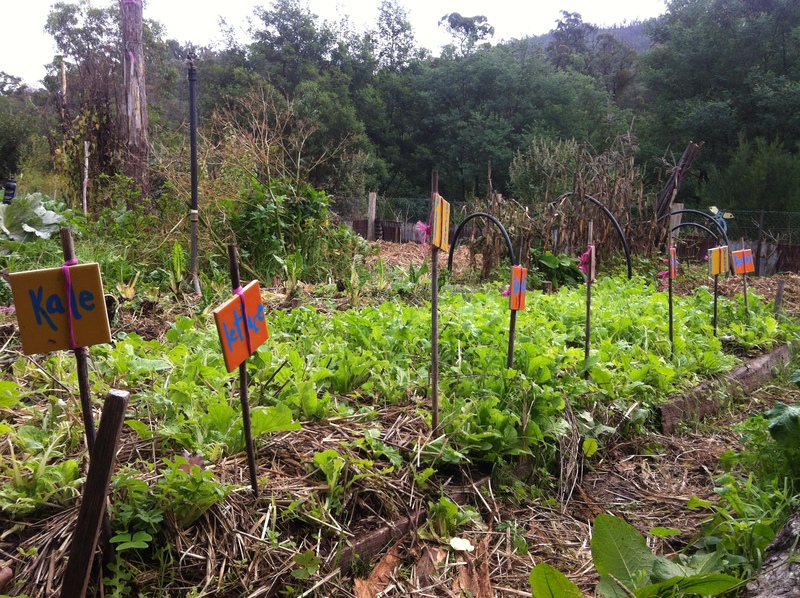 It wasn’t long before new faces joined me, so we chatted and dug and weeded some more. There was a stream of new faces across the afternoon – they all came for a while, settled briefly and got the hang of the job, then went again looking for something more interesting to help with! I didn’t mind; I wanted to finish what I’d started. To be honest, I just wanted to dig. It’s not often that I am able to completely immerse myself in a task. At work, as for most people, there are constant interruptions. Even at home I’m my own worst enemy – prepping and cooking dinner while I watch a DVD or listen to the radio and track the news, weather, sports, or my friends’ happenings on my domineering smartphone. To be given an opportunity to slow down, turn off all those distractions and focus on one job was heavenly – meditative, therapeutic and exactly what I needed. Cowardly though it was, I shunned the opportunity to experience the showers as evening set in, opting instead for a freshen up and then adding on layers to keep me warm for the evening ahead and eventual collapse into my sleeping bag in the bunkhouse. Dinner was under the stars around the fire pit, shared with around 30-40 people. And it was tasty! Dessert was even better. As the night wore on, the talk around the fire offered an opportunity to reflect. There were certainly some interesting characters among the Wollangarra support network, pretty varied too, and it was on the whole an entertaining listen. I felt this was a crew I’d be happy to get to know a little better. Creeping into the bunkhouse at I have no idea what time (but on reflection I suspect was actually probably quite early!) I fumbled about in the dark, covering my torch as much as possible to avoid disturbing others; then heaved myself up into the top bunk I’d chosen and settled down to sleep. It came quickly, despite realising that the thin mattress wasn’t providing much support for someone who’s getting a bit creaky with age and is used to a decadent physio-approved bed! I woke during the night – again no idea what time – and now that the extreme need for sleep was gone, it was harder to get back into any kind of comfortable position to try for a second round. I tossed and turned and eventually dozed off not too long before it started getting light, when I needed to get up to catch breakfast and try to feel human again. Fortified by herbed baked beans and drop scones, I made a beeline for the garden once more. More black fingers, more bulbs, a few fellow helpers now and then, but longer stretches on my own that morning. Which was fine by me. Tiny waggy-tail birds joined me at times, chirping away – wrens I think. I’ve never been great at flora and fauna ID! Once each hour at least, I took a welcome break from the garden to stretch my legs, arms and back and help unload a trailer load of wood that had been pulled by tractor across the river from the site of chainsaw training earlier in the year. One of the weekend’s main tasks was compiling a massive pile of wood in readiness for the big wood chop next month (which usually attracts around 100 volunteers, and will hopefully be my next visit). By the time we broke for morning tea, former staff member Lou, who had been working alongside me for the last hour, decided that with home-time approaching we should call it quits on oxalis and plant up the beds so that there was a chance something might grow. I couldn’t argue with that thinking! 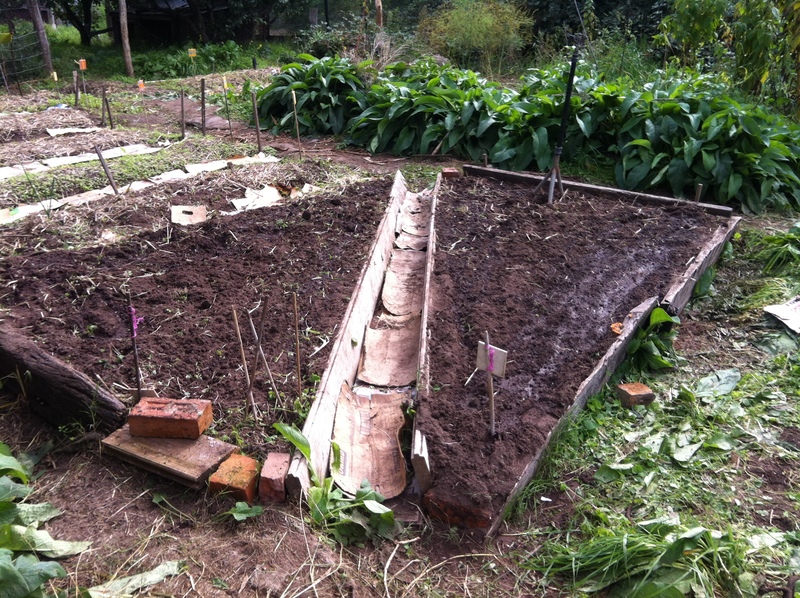 An hour later we’d sowed carrot, radish, daikon, onion and parsnip seeds across the two beds. Unfortunately most of the packets (donated) were a little out of date, so it’s probably a bit hit and miss whether they’ll survive, but I look forward to finding out down the track. I’ll be happy enough if a reduced number of oxalis weeds growing back tells the story of the many hours spent hunched over those garden beds. I continued my exploration of the site. Outside one of the huts, rucksacks were being repaired using a beautiful old treadle Singer sewing machine. It had been gifted during the 1990’s to the wife of the centre’s founder Ian Stapleton, and still had with it the original instructions booklet and guide – dated 1912. In the laundry were great old boilers, with manual wringers lined up ready next to them. It’s a whole other way of life. After lunch, I made my way back across the river with new friends, clutching a few branches of a trimmed bay tree, and re-joined Sweetie for the long drive home. I was physically exhausted but felt calm and reflective, and so happy I’d made the trek across the state to be there. As for the job vacancy, well by the time day two dawned the whole purpose of the place hit home with a jolt. The core purpose of the centre is to take groups of teenagers out into the wilderness on hikes, or to undertake practical conservation work with them, and to introduce them to a simpler way of life than our hectic modern-life pace allows. As rewarding as I’m sure the job would be, and though I find the people who do it inspiring, there are a number of problems with being part of that central purpose for me: a huge physical component of work for an understrength and ageing body; lots of people descending on the place regularly; the time-consuming ways of living and job demands that I could see would leave me little room to write; and lots of teenagers. Don’t get me wrong: I don’t dislike teenagers especially! But I simply am not used to them. I’ve spent so much of the past few years on my own, that adjusting to any kind of regular company is often a struggle. The extra exuberance, ego and attitude you often find with a group of teens – even (or especially?) ones who are out of their comfort zone – would no doubt be a huge test. I got the distinct impression that I might just end up feeling, well … old! So it’s back to the drawing board on the job front. At least I know now there’s a magical place I can go from time to time to disconnect from the 21st century and re-connect with the simple and important basics – good company, extraordinary people, wholesome food, inspiring surroundings, and a considered and thoughtful lifestyle. I feel certain it won’t be my last visit to Wollangarra. This entry was posted in Uncategorized and tagged alpine, gardening, Gippsland, Heywood, hiking, Ian Stapleton, Lake Glenmaggie, Macalister River, oxalis, practical nature conservation, simple living, Wollangarra Outdoor Education Centre. Bookmark the permalink. I saw this linked from the Woll Facebook page. Thank you for writing and sharing – it was a real pleasure to read and experience that wonderful weekend again through someone else’s eyes. 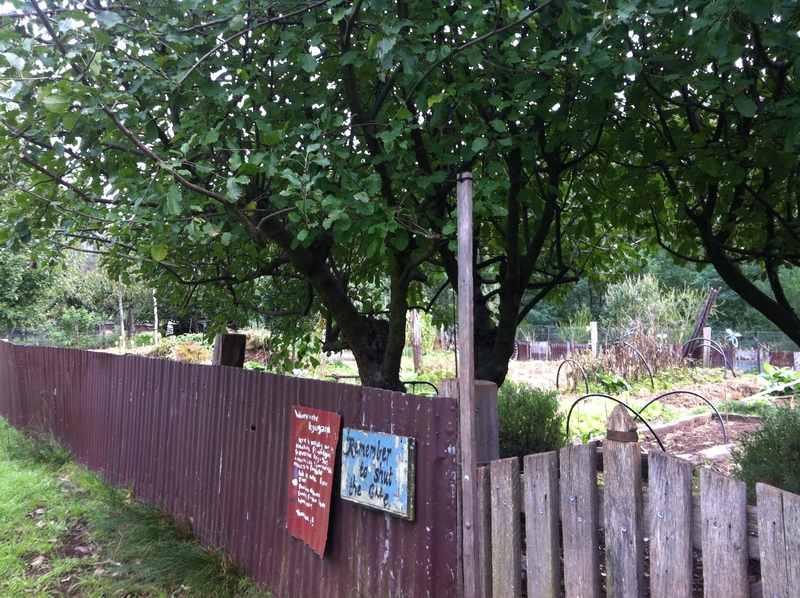 I really hope you can return for Wood Chop and see how those garden beds are progressing – it would be great to see you again! I’m not sure if I’ll get to the wood chop now unfortunately 😦 as I’m returning to Western Australia at the end of June and have quite a bit to sort out before then. But I’ll see how things go in the next couple of weeks, and I’ll let you guys know either way.